The famous Grand Strand consists of 60 miles of some of the finest beach and vacation property in the United States. With a slightly more temperate climate than Florida, we still experience mild winters and our spring and fall are like complete paradise. South Carolina and the Strand offer a low cost of living, yet every cultural and lifestyle enhancement you could ask for. Families and retirees alike can live here comfortably. Our real estate choices are as diverse as our residents. 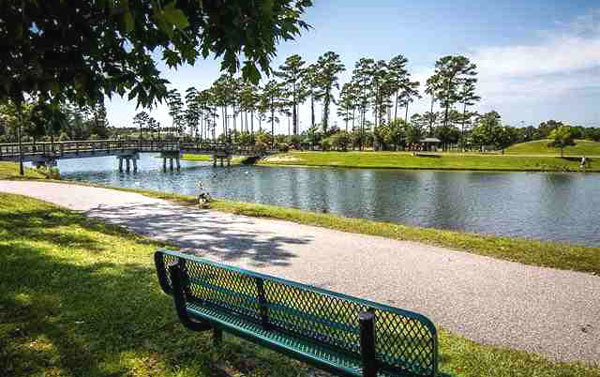 From elaborate oceanfront luxury estate homes, to fine gated golf communities with every amenity, to modest beginner homes or condos, we have properties and land for sale in Myrtle Beach that will fit almost any budget. The Grand Strand offers more in the way of single family homes than anywhere on the east coast. You can live on the Intracoastal Waterway with your very own dock and hop in your boat on a whim. The gated golf communities with condos and townhomes are second to none for privacy and breathtaking views of the beautiful greens, ponds, gardens, and lakes. One of our finest neighborhoods is Carolina Forest, just outside of the city on Highway 501. Carolina Forest boasts one of the finest schools in the south - one of five SC district schools that surpass the national SAT average. If you're looking for the perfect "Leave it to Beaver" community, check out the Carolina Forest Real Estate pages and learn all about this city within a city!. North Myrtle Beach offers several of the best golf communities around, such as the Barefoot Resort, or Tidewater. Just a bit further north is Little River, with condos galore as well as beautiful homes on the golf courses. Surfside Beach, Garden City, Murrells Inlet, and Pawley's Island offer a non-tourist lifestyle just minutes away from the many fine restaurants and live shows that draw our life-blood - vacationers - to the Grand Strand by the millions. Both taxes and traffic are lower in these little coastal townships and unincorporated communities. If you dream of owning a perfect beach house in a perfect spot, this is it! Located along the legendary “golden mile” stretch of Myrtle Beach; a quiet, comfortable neighborhood hugging the Atlantic Ocean -- this home is at the compass center of the “mile” farthest away from commercial activity, yet within easy reach of the restaurants, golf courses and shopping that make Myrtle Beach famous. The most popular properties we have would be our luxury vacation condos. With literally thousands to choose from, you can buy a small beachfront efficiency condo from as low as $50,000 - up to a million dollar magnificent penthouse with the finest upgrades and luxury interiors. We can find a residence or vacation home that can change your life. Century 21 The Harrelson Group is a different kind of real estate agency. Greg Harrelson has spent 15-plus years studying the local market conditions and coaching his agents how to be the best. We offer monthly newsletters and market news that is up to date and can keep sellers and buyers on the cutting edge of investment knowledge. Our goal is to make this website THE most information-filled real estate site on the web, and we are gathering unique tools that will convince sellers we are the best agency to sell your home. We have more listings than any Myrtle Beach real estate agency, and we've sold more volume than any agency in the county. Check out the 600-plus homes for sale we have in our featured listings section. To see how we market your property better than anybody else in the Grand Strand, read our Sell This House section. On the other side, we can advise buyers where and when to find the most lucrative property purchases - as well as which places to avoid. Our job is to know the market, and we take that responsibility very seriously. Research the neighborhood or condo resort before you waste time looking. In the market to build a new home? See our new home section or check out our latest website just for New Homes in Myrtle Beach. You won't find a harder working team of Myrtle Beach Realtors anywhere! We want to be YOUR Realtor choice, and your needs will be our priority. Check back often, subscribe to our Blog, or join our mailing list to keep informed of everything that's going on with Myrtle Beach real estate!